Microsoft: Conversation is central in our everyday lives. We chat to stay in touch, to share news and ideas that excite us, and to make plans for getting together with family and friends. But we often find ourselves in need of information—a fact to share, a place to meet, a movie time, or the perfect restaurant. Looking for information often requires interrupting the conversation, even if briefly, and switching apps to find what we’re looking for and bring it back into the conversation. But shouldn’t technology make our lives easier and truly bring the answers we need to our fingertips? At Skype we are certain about it, and it’s with this goal in mind, that we are bringing Cortana, Microsoft’s intelligent assistant, into Skype to help you in your everyday conversations. With Cortana’s in-context assistance, it’s easier to keep your conversations going by having Cortana suggest useful information based on your chat, like restaurant options or movie reviews. And if you’re in a time crunch? 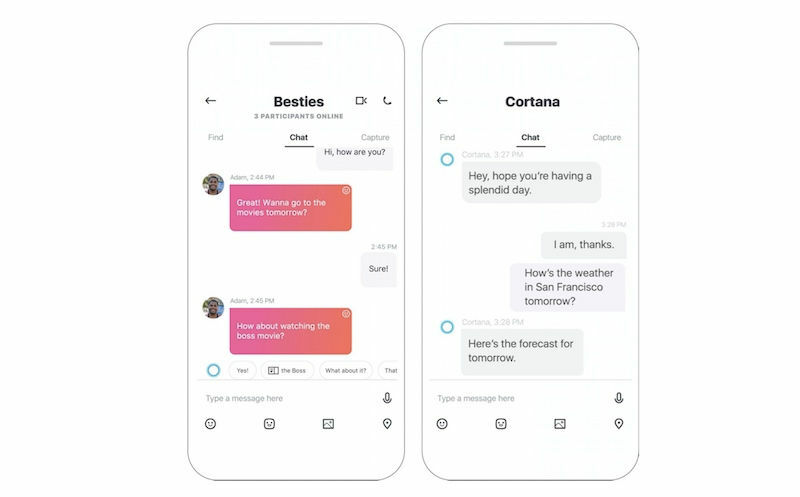 Cortana also suggests smart replies, allowing you to respond to any message quickly and easily—without typing a thing.